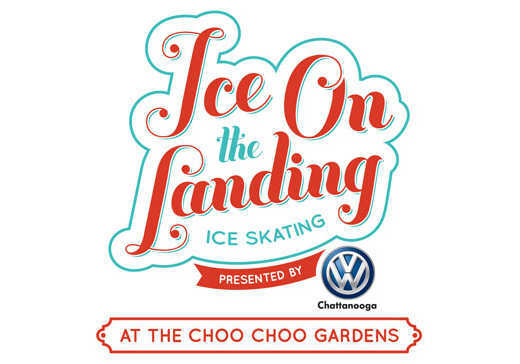 Chattanooga, TN — Chattanooga Presents has announced that Ice on the Landing, presented by Volkswagen Chattanooga will be relocating to the beautiful outdoor gardens at the historic Chattanooga Choo Choo this season. Having drawn over 30,000 skaters to the waterfront for each of the past two holiday seasons, Chattanooga’s popular open air skating rink will now be surrounded by gas lanterns, fountains and gardens at the Southside’s iconic landmark. People of all ages will be able to enjoy this classic winter activity again this year from November 18 through January 16. Changes are being made to the Glenn Miller Gardens at the Choo Choo to accommodate Ice on the Landing, which will keep its name, while adding the tagline "At the Choo Choo Gardens." The dimensions of the rink will be 40’x140’ (as compared to last year’s 60’x100’ size). This year will also feature a brand new rink and equipment including new skates, all being designed specifically for this new space. Ticket pricing will remain the same, with $10 for an adult ticket, and $8 for skaters aged 12 and under. This includes skate rentals and skating for two hours. The only ice-skating option offered either indoors or outdoors in Chattanooga, Ice on The Landing has established itself as a new wintertime tradition in Chattanooga’s bustling southside by offering a unique recreational opportunity during the holiday timeframe. 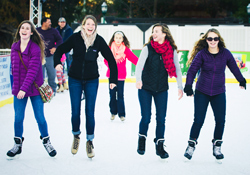 Ice on the Landing will be open every day within its eight-week season, including a lively schedule that accommodates public skating and features special themes and events, music and promotions, as well as certain nights that benefit local charities. Birthday skating parties will continue to be offered, with pizza and cupcakes being served in an indoor Arcade next to the rink. Season passes will continue to be offered for $100, as well as gift cards for the rink. 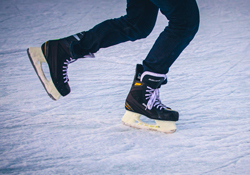 In addition, Ice on the Landing will offer a Basic Skills skating course each Saturday and Monday morning prior to opening hours. As always, visitors to the rink can stay warm with hot chocolate and other favorite cold-weather food and drink on site. Ice on the Landing presented by Volkswagen Chattanooga is also made possible through sponsorships from Tennessee Valley Federal Credit Union, BlueCross BlueShield of Tennessee, Maven Group LLC, Puckett’s Chattanooga and Children’s Hospital at Erlanger. Media partners are the Chattanooga Times Free Press, Sunny 92.3/Hits 96 and WRCB TV 3.